NETWORK FINALS: OLYMPICS coverage adjusted up 0.1 in final numbers, but FOX’s baseball game lost the same. Local preseason NFL preemptions may have caused some of the other shifts: on ABC, the SHARK TANK rerun and 20/20 each lost 0.2, and WHAT WOULD YOU DO was down 0.3; on CBS, the reruns of NCIS: LA and HAWAII 5-0 were down 0.2 and BLUE BLOODS slipped 0.1; and on CW, the MASTERS OF ILLUSION and PENN & TELLER: FOOL US reruns were all down 0.1. CABLE HIGHLIGHTS: The RIO SUMMER OLYMPICS led cable, with NBC Sports Net’s primetime coverage peaking at 0.52 (0.37 for its daytime telecast), CNBC at 0.17, USA at 0.14, MSNBC at 0.013, Bravo at 0.08, and Golf Channel at 0.07. On Adult Swim, THE ERIC ANDRE SHOW was down 0.03 to 0.47, and MDE WORLD PEACE dropped a tenth to 0.35. 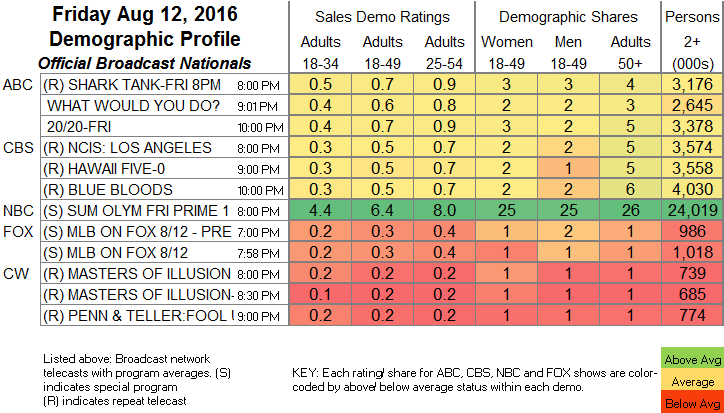 Lifetime’s BRING IT gained 0.09 to 0.47, and THE RAP GAME was up 0.04 to 0.45. Disney Network scored 2 shows in the Top 10, GIRL MEETS WORLD at 0.44, and the just-renewed ELENA OF AVALOR at 0.34. (More family shows hovered just outside the Top 10, with Nickelodeon’s MUTT & STUFF at 0.33, and Cartoon Network’s STEVEN UNIVERSE at 0.28.) The Olympics had some sports company thanks to preseeason NFL, which gave NFL Network a pair of Top 10 games, Detroit vs. Pittsburgh at 0.40, and Oakland vs. Arizona at 0.36. 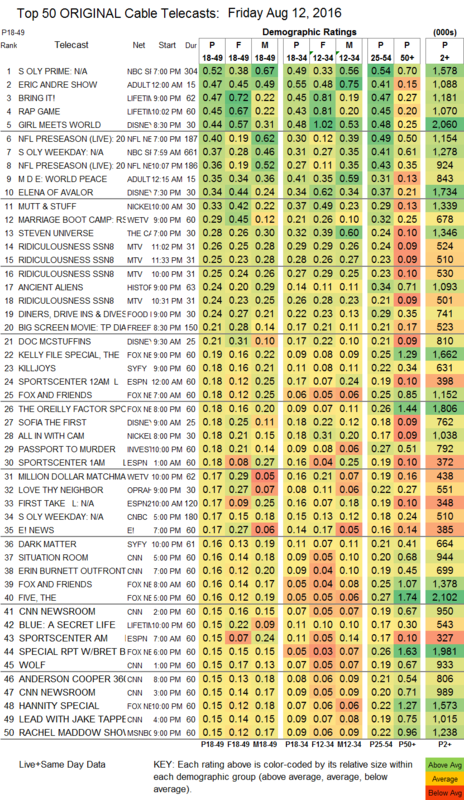 We’s MARRIAGE BOOT CAMP gained 0.06 to 0.29, and MILLION DOLLAR MATCHMAKER was up 0.03 to 0.17. MTV appears to have aired 4 episodes of RIDICULOUSNESS at 0.26/0.25/0.25/0.24, compared to 0.26/0.25 for 2 episodes last week. History’s ANCIENT ALIENS was at 0.24. Food Network’s DINERS, DRIVE-INS & DIVES was at 0.24. On Syfy, KILLJOYS rose 0.05 to 0.18, and DARK MATTER ticked up to 0.16. OWN’s LOVE THY NEIGHBOR had an extra tick to 0.17. Bravo’s REAL HOUSEWIVES OF MELBOURNE fell 0.04 to 0.07. The season finale of Cinemax’s OUTCAST (which is indeed returning for a Season 2) held at 0.06.